Just fill in your info in the form below, hit SEND, and a download link will appear. Over the years, many teachers have told us that these films seen on NATURAL HEROES offer a valuable resource for the classroom. To help more teachers and students take advantage of the rich content of these timely stories, we have developed a 46-page classroom guide consisting of 6 projects aligned to common core to accompany these films. We also have included interactive links to additional resources and short video selections from the films to use with your students. You’ll find that the heroes in these films are fueled by passion, yet apply the critical thinking and problem-solving strategies that today’s students need to develop. Their backgrounds range widely to include wildlife experts, inventors, urban farmers, soil scientists, Native American elders, and some young people whose efforts are certain to inspire your students. The individuals profiled in NATURAL HEROES are action-oriented people. In keeping with that spirit, we have designed project-based learning plans for K-12 classrooms that put students in the role of active problem solver. These plans are more ambitious than simple discussion guides but, as a dynamic educator, you will find that leading projects that focus on timely, real-world content is worth the investment in teaching and learning time. 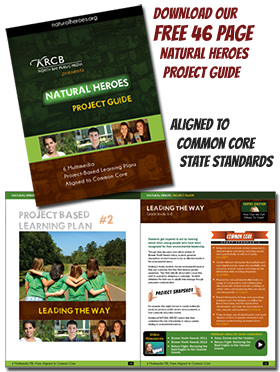 Stations recommend Natural Heroes as an educational resource.